Most of you will know of, if not visited, Sand Sculpting Australia's annual Sand Sculpting Exhibition held at Frankston Waterfront every summer. This year's event sees some 3,500 tonnes of sand transformed into a display of themed sculptures and related activities. Usually, Sand Sculpting Australia opens on Boxing Day; this year is no different, however, for the first time ever, Sand Sculpting Australia will open a Christmas themed event prior to Boxing Day. 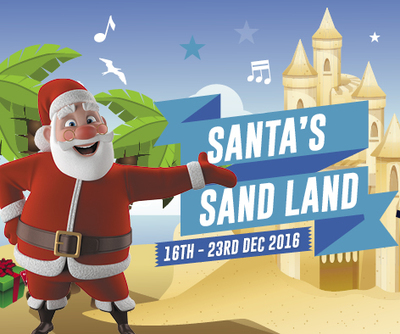 From 16 December 2016, you and your family are invited to join "Santa’s Sand Land”, which will be held inside Sand Sculpting Australia in Frankston. This special 8-day festival introduces the magic of Christmas to the annual sand sculpture display, with festive themed fun for the whole family. As well as the opportunity to see the 2016/2017 exhibition for the first time, your children get to enjoy santa’s busy workshop and take part in Christmas themed sand activities. Find out more over on sandsculpting.com.au/frankston-waterfront or via the Event page on Facebook.